Lush vegetation, tropical birds, white sand beach, a real paradise for relaxing in the Osa peninsula! Book your Family Tour Today! 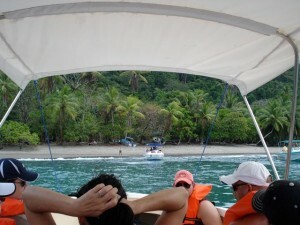 The San Josecito Beach Family Tour departs from Punta Uvita at 7:00 AM and arrives 1 ½ hours later to San Josecito Beach, a beautiful white-sand beach located in the lush Osa Peninsula, only ten minutes away from the Corcovado National Park. The tour consists of a guided hike, which will take you to a vantage point from where you can enjoy the magnificent views of Cano Island, the Pacific Ocean and the amazing Scarlet Macaw birds. Afterwards, you may do some snorkeling in the warm and crystal-clear waters of this paradise or just doze in a hammock on the white sand while our guide prepares a picnic lunch for you. During transit you may observe whales, dolphins, turtles, marine birds and fantastic views of the southern pacific Osa coastline. 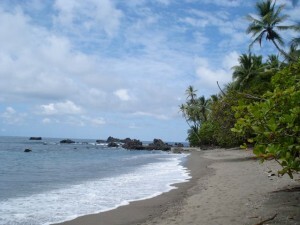 The tour returns to Punta Uvita at 4 PM.